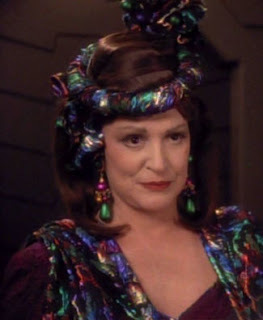 I have a confession to make: one of the biggest reasons why I watched Star Trek: The Next Generation was because from the very beginning, I became a fan of Lwaxana Troi: the outrageous, overbearing mother of Deanna Troi, both hilariously and tragically portrayed by Majel Barrett-Roddenberry. Of course, that wasn't Barrett's only connection to Star Trek. She was also Nurse Chapel in the original series. She played Number One in "The Cage": the first pilot episode of Star Trek. Hers was the ubiquitous voice of the Federation starships in the later series. And yes, she was the wife of Star Trek creator himself, Gene Roddenberry. Just a few short days ago, it was announced that Barrett would be returning as the computer voice in J.J. Abrams' Star Trek movie later this summer. A lot of people rejoiced at hearing that news. And now those same people and many, many others are grieving at hearing that Majel Barrett-Rodenberry has passed away from leukemia at age 76. This is sad news. I always prided myself on being a star trek fan, but did not realize this woman played such an intricate part in all of the series. I am lucky enough to have her voice on my phone as a ring tone: "Communications Channel Open". Thanks for this info, Chris! Early on, she realized that there was gold in them thar' stars . . . and she was a gold-digger par excellence. She turned her passion for manipulation into a life-long obsession, holding the great bird in a less-than-guilded cage until the poor thing died, then coddling its eggs in her bosom until they rotted.